The number of people in the United States without a home is down from one year ago. The total is nearly 550,000, about 3 percent lower than in 2015. The number comes from the Department of Housing and Urban Development. The information comes after the United Nations (UN) reported that homelessness is "spreading" worldwide. The report called on governments around the world to end homelessness by 2030. The UN last produced a study on the world's homeless population 11 years ago. At that time, it estimated the total at 100 million. But the UN said the number is likely much higher today. It estimates 100 million children alone are now without a home. Recently, UNICEF, the UN's children's agency, warned about children living in and around the city of Mosul, Iraq. It said tens of thousands of them could become homeless as Iraqi forces continue work to take back Mosul from Islamic State militants. In its report, the U.S. Department of Housing and Urban Development measured homelessness on a single night. In January, 2016, thousands of volunteers spread out across the country. They counted a total of 549,922 homeless individuals. That is down 14 percent from six years ago. Still, the government agency reported increased homelessness in the cities of Los Angeles, Dallas, Seattle and Washington, D.C. Officials blamed the increase on higher housing prices. Julian Castro is the Secretary of Housing and Urban Development. He said it is important that more be done to help people find a place to stay for themselves and their families. "Every person deserves a safe, stable place to call home," Castro said. In recent years, a major effort has lowered the number of homeless military veterans, he said. While Castro points to some progress in the United States, UN officials say homelessness is now a problem in all countries, rich and poor. Leilani Farha, the top UN official on housing, said homelessness is an issue of life-and-death importance. "The death rate among homeless people ranges from two to 10 times higher than for those who are not homeless," she said. In the Kenyan capital of Nairobi, 250,000 people do not have a place to stay. Many of them are children, and live on the streets. In India, the homeless population is estimated at 78 million. Eleven million of that number are street children. Indonesia's homeless population is 3 million, including 28,000 in the capital, Jakarta. In Nigeria, the homeless population is estimated at 24 million. Homeless World Cup blames rapid urbanization and poverty for the high number. Also many people lost homes because of actions by Boko Haram militants, the group said. 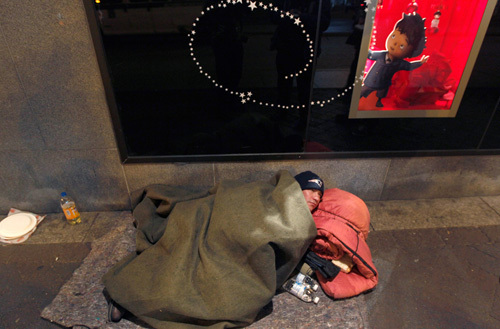 In England, 112,070 people declared themselves homeless in 2013. That is a 26 percent increase from 2009. The Minister said the Urban Development Corporation was now transforming the area. The Kurds are spread out across five nations. I live on my own in a studio flat. 1.At that time, it estimated the total at 100 million. At that time we were students. I cannot describe the feeling of contentment that was with me at that time. 2.It said tens of thousands of them could become homeless as Iraqi forces continue work to take back Mosul from Islamic State militants. If I buy something and he doesn't like it I'll take it back. I take it back, I think perhaps I am an extrovert.